Between you and me I love bowls. More specifically I love to eat out of bowls. There is just something about eating from a bowl that makes food more satisfying. I can sit in a chair with my legs crossed holding a bowl in one hand and a fork in the other. I can hold the bowl close to my face and take in all food’s smells and colors. Normally bowls are associated with cereal, ice cream or pasta, but what about rice bowls? I love a good rice bowl! They are nutritious, satisfying and can be filled with all kinds of awesome goodies like fresh fruits and vegetables. 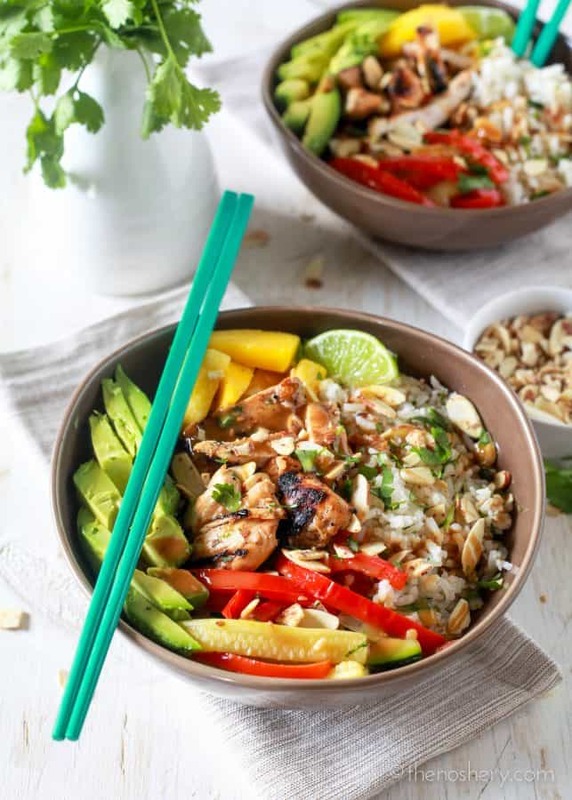 This particular rice bowl is one of my favorites, and it’s the bomb! Just saying. 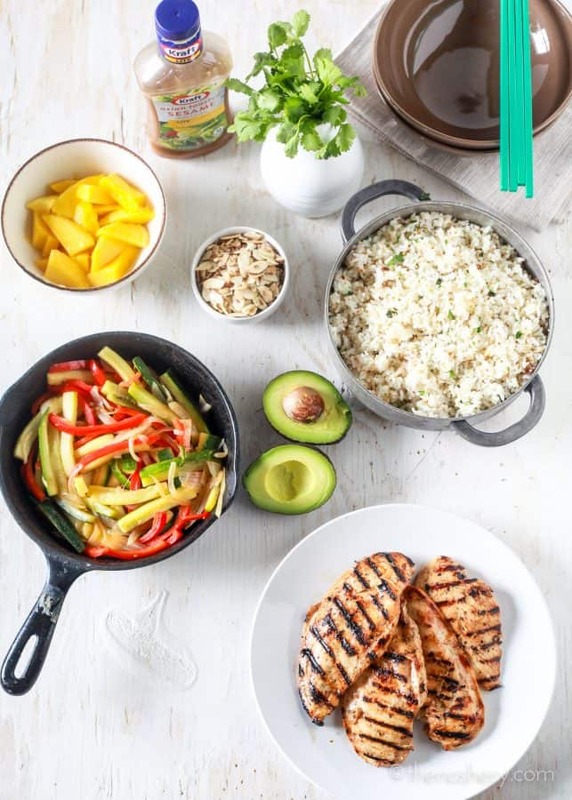 It has a little bit of everything; grilled chicken marinated in an Asian sesame dressing, fragrant coconut rice, sautéed fresh vegetables, sweet mango, ripe avocado and crunchy toasted almonds. I make a lot of marinades but, I also love to use a good vinegar and oil based salad dressing and a marinade. Marinating the chicken for this rice bowls in dressing is a great and simple way to change up your dinner routine. It’s the perfect way to infuse some great flavors in your weeknight dinner. It’s sure to please your whole family. One of the things that I love about rice bowls is how every bite can be customized. You want a little bit of everything or a lot of one thing it’s up to you. Making every bite different and exciting. Rice bowls are also easy to change up. Choose whatever protein or vegetable your heart desires and it’s a whole new ball game. You can even change up the grain, use quinoa or brown rice instead, the possibilities are endless. Don’t want Asian rice bowls? Then make it Italian, use farro or plain rice, marinade the chicken in a balsamic vinaigrette, add roasted veggies and parmesan cheese. It really is all up to you. 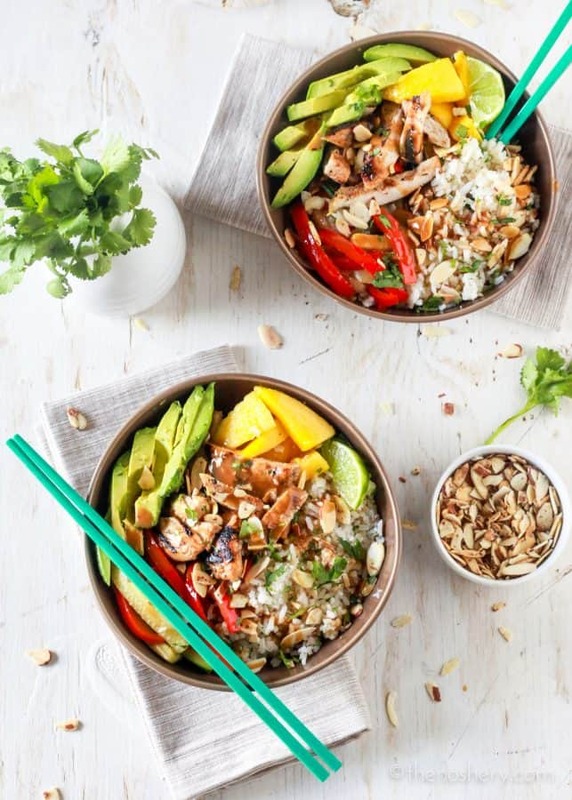 Rice bowls full of flavor and veggies! Combine chicken and dressing in a resealable plastic bag. Allow to marinade in the refrigerator for 30 minutes. When ready to grill, heat a grill skillet or skillet over medium-high heat. Cook chicken breast 3 - 4 minutes on eat side. Set aside and tent with foil to keep warm. Drizzle oil into a 4 quart pot with a tight fitting lid. Swirl to coat bottom of the pot. Combine rice, coconut milk, coconut water, water and salt in the pot and set over medium-high to high heat. Stir occasionally to keep rice from sticking to the bottom of the pot and burning. Wait for coconut-water come to a gentle boil, reduce heat to low and over tightly with a lid. Let simmer covered for 15-20 minutes, or until most of the liquid has been absorbed by the rice. To check, pull rice aside with a fork once mostly dry turn off heat and replace lid. Let sit another 5-10 minutes, or until ready to heat. Rice will stay warm up to an hour if left covered. Heat a large skillet over medium-high heat, preferably, not a non-stick skillet, add vegetable and sesame seed oil. Allow the oil to get hot, add vegetables. Sauté until vegetable are tender and starting to caramelize about 7 minutes. 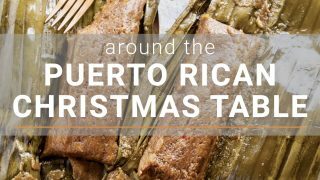 Season with salt and transfer to a plate or bowl and set aside. Using the same skillet toast the coconut rice. Heat the skillet over high heat, add rice. Toast the coconut rice until you have a few bits of browned rice, turning occasionally, about 10 minutes. Keep an eye on it to keep it from burning. Toss rice with 2 tablespoons chopped cilantro and zest of 1 lime. 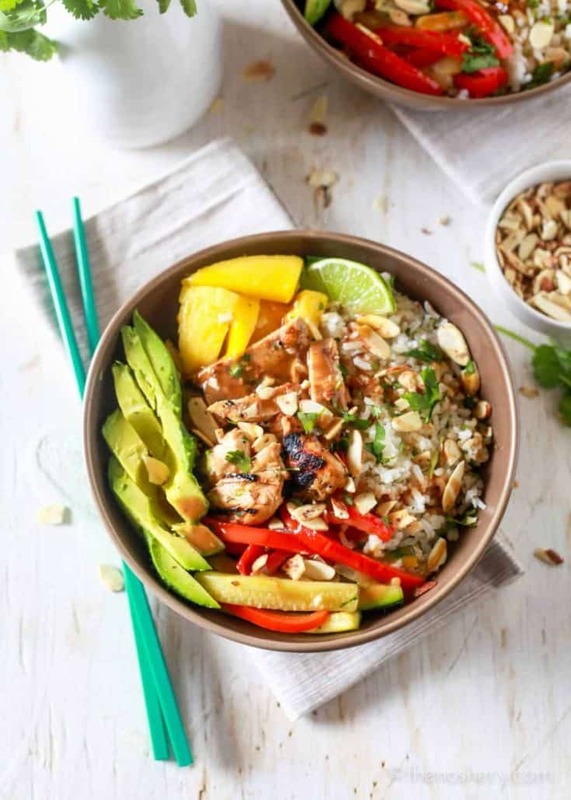 Divide between 4 bowls, 1 cup of rice, 1/4 cup of sauté vegetable, 1/2 a mango, 1/2 avocado, 1 tablespoon sliced almonds, 1 sliced chicken breast and drizzle 1 tablespoon of dressing. Brown Rice - Increase water to 2 1/3 and simmer covered on low for 1 hour.